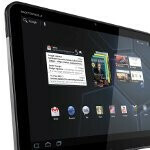 Verizon has finally launched a version of the Motorola Xoom tablet that has the 4G LTE radio already built-in and can be had for $499 with a two-year contract or $669 without the ball and chain. The Motorola Xoom was the first tablet to feature the Android Honeycomb platform. It has a 10.1-inch display and is powered by a dual-core 1GHz Tegra 2 processor and 1GB of RAM. The Xoom has a pair of cameras; a 5 megapixel camera is on the back that can record video in 720p HD while a front-facing 2 megapixel camera is present to aid in video chatting. When the Motorola Xoom first landed at Verizon it carried with it 3G connectivity. At the time of its launch it was known that users would be able to upgrade their device to access the 4G LTE network but it would have to be sent in to the manufacturer in order to add the required hardware. It certainly took long enough for Motorola and Verizon to offer a Xoom with LTE included at the time of purchase. The 4G LTE ready Motorola Xoom is available in a 32GB model only. Considering that the Xoom is heading towards obsolete status, would anybody consider ponying up $499 for this tablet knowing that a contract is required? We’d like to hear what you think. Did the delay have anything to do with Tegra 2/LTE incompatibility? This upgrade was supposed to happen many months ago. It wasn't upgraded it was rebuilt. The original still lacks LTE doesn't it? There was supposed to be a program to send in 3G Xooms for upgrade, but that got delayed just as long. the original xooms are being upgraded as we speak. some people are having delays, but a lot of people (including me) have sent their original xoom in and gotten it back with all its LTE glory. As for the question...no i wouldn't pay $499 with a contract. I'd sell mine (contract free) to anyone willing to pay $499. You'd have to be a very ill informed customer to pay this price. So many better options for less. What is Moto thinking? FAIL. motorola never thinks, they never have. thats why all their products are garbage. WalMart is blowing out its current inventory of the original Xoom for as little as $398. So far there are very few buyers at $200 off the original MSRP. Two things strike me funny about this article/ comments. First, the picture of the Xoom phonearena has is for the wifi only version not the 3G/4G version from Verizon. Second, why does everyone bash the Xoom. I have an iPad and a Xoom. I would take the Xoom over the iPad any day of the week. It has a 1Ghz dual core processor, 1GB of ram and a 10.1 inch screen plus a usb port that you can use for a keyboard or mouse or a memory card. I am not sure why it gets such bad press.